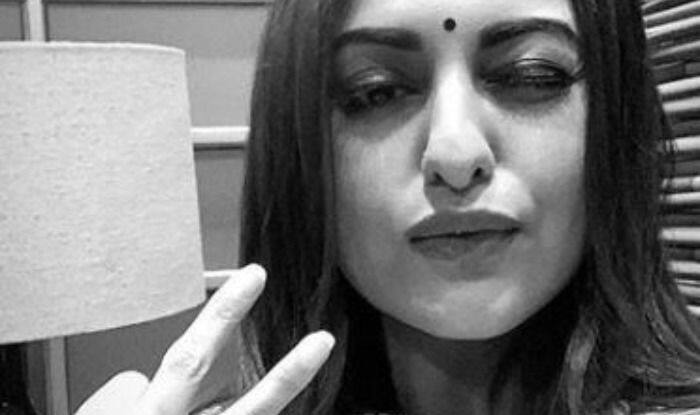 Sonakshi Sinha headed to Madhya Pradesh to join Salman Khan and the team of Dabangg 3 after the trailer launch of Kalank. Sonakshi Sinha earlier today released the trailer of her film Kalank and post the trailer launch the actor headed to shoot Dabangg 3 with Salman Khan. Post the trailer launch, Sonakshi headed to Madhya Pradesh to join Salman and the cast and crew. She even took to her Instagram story to share a picture of herself and captioned it, “On my way to #Dabangg3”. Earlier, a report in MumbaiMirror quoted a source saying, “In his back story, which is a kind of prequel, Chulbul will be shown as a local goon with a heart of gold and a lengthy flashback will cover his metamorphosis into a Robin Hood cop. The conflict in the present with Sudeep is connected to his past before Chulbul got into uniform. Everything that the brand is synonymous with has been retained and adapted keeping modern-day sensibilities in mind’. Sonakshi made her big Bollywood debut with Salman Khan in Dabangg (2010) and was applauded for her performance. She was also there in the second part which released in 2012. She is now all set to star in the third part of the film. Earlier today, Sonakshi was seen at the trailer launch of Kalank, a period drama set in the 1940s. The film has an ensemble cast of Sonakshi, Madhuri Dixit Nene, Varun Dhawan, Alia Bhatt and Aditya Roy Kapur. The film which was earlier supposed to release on April 19 will now hit theatres on April 17. At the trailer launch, Sonakshi donned a stunning embellished suit. With subtle makeup, wavy hair and oxidised earrings, Sonakshi looked drop-dead-gorgeous as always. She will be seen romancing Aditya in Kalank.